Ironically when spring arrives, and the skiing is finally fantastic, most families stow the ski gear and haul out the bikes and baseball gear. 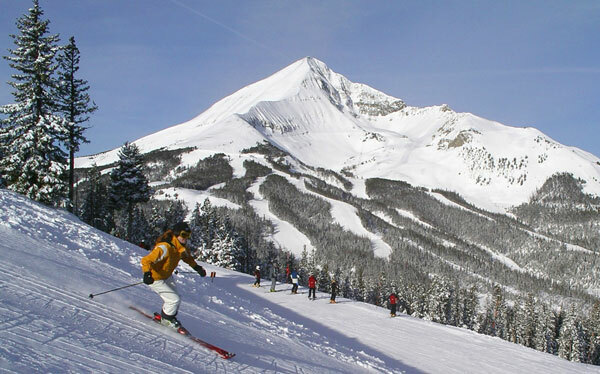 March and April are the best months for family skiing, with the best spring ski events. 1. Longer, brighter, sunnier days on the slopes beat the flat light of December. 2. Trail counts are up with a season’s stockpile of snow. 3. Temperatures are far more enjoyable than frigid January. 4. You can wear sunscreen instead of facemasks. 5. No more pockets full of hand warmers and pricey hot cocoa breaks for the kids. 6. Sunglasses take the place of face hiding goggles. 7. Burgers served out on the deck taste better than those in the cafeteria of crowded base lodges. 8. 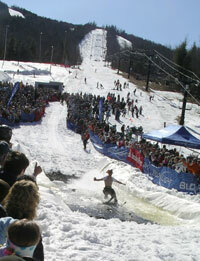 Silly events like dummy downhills and pond skimming are kid pleasers. There’s nothing more fun than watching clowns and cardboard contraptions crash, like Funniest Home Videos on snow. 9. You can shed your restrictive winter survival suit for silly spring clothing. Retro outfits and Hawaiian shirts add color and character to your ski day. 1. Slather the kids with sun screen. 2. Warn them about the ever changing consistency of spring snow – how in one run you can go from frozen concrete to creamed corn to glue that throws you forward while your skis stick still. 3. Be sure to dry ski boots (and clothing) at the day’s end. Spring temperatures, slushy snow and sweat make for soggy, smelly boots if not tended to with a boot dryer. Little kids sweat too- trust me on this one. 4. Make sure your kids stay hydrated on the inside, drinking lots of water, but not melting snow. Say not to spring sports, except skiing! This message is brought to you by an overzealous ski mom.